Looking For Some Easter Entertainment? Get the Kids Outside this Easter Holidays! The Easter break is coming up quickly, and the kids are going to need entertaining. You can make sure they get fresh air by taking them out on their own bike, quad or kart! Watch them learn and thrive as they hone their riding skills. Hurry, order soon to get them delivered in time for the holidays! 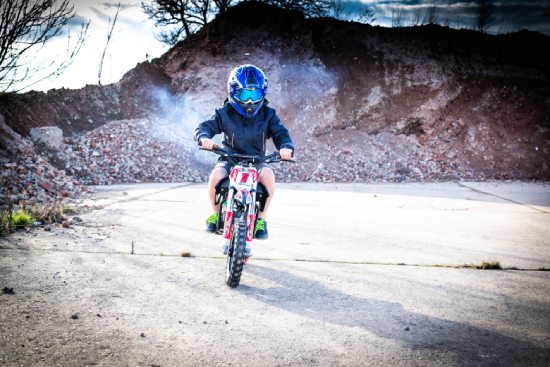 If your little adrenaline junkie is itching to get involved in all the track action, then it’s time to introduce them to the world of dirt and pit bikes! Our a range of mini bikes are known for their durability, reliability and safety. 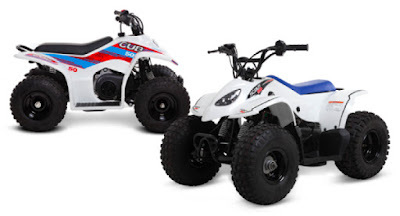 These Mini Quads are perfect for getting your kids into off-roading in a fun, but controlled way. If you’re looking to treat your little rider, then look no further. High quality, durable and above all else, safe! 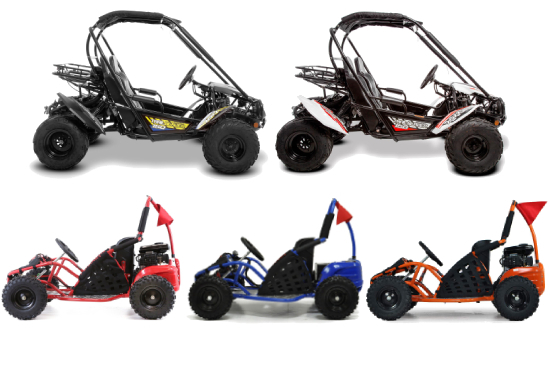 These Go Karts and Buggies are amazing fun, perfect for any easter adventure. We have small karts and buggies for any junior adrenalin seeker! With models to suit all ages, you're sure to find something you love in this SMC quad range! 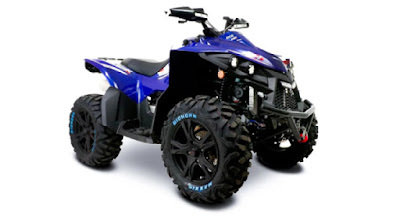 SMC is one of the world's longest established ATV manufacturers, producing market leading products with top-level design and technology. Plus get 2-year parts and labour warranty on all models! The MBX 850 has been designed from the ground up for performance, handling and rider exhilaration! Powered by a new generation V-Twin engine, the MBX produces more torque than almost all other competitors in its power category. This gives the MBX superior power to take on all terrains and scenarios thrown into its path. The Hornet 100 is the ultimate junior quad. 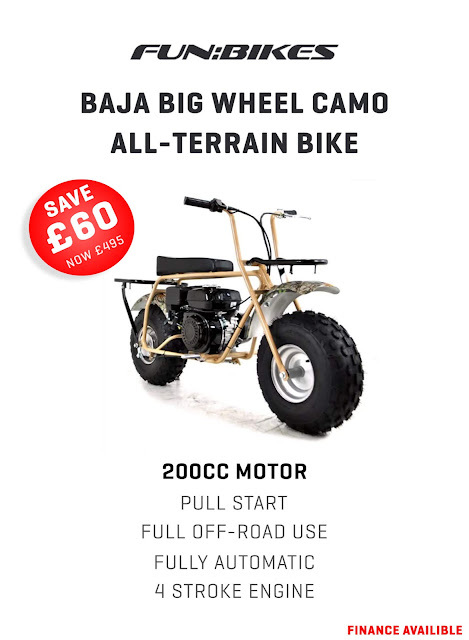 Fitted with a time proven 2 stroke engine, for full-on off-road fun! But with safety features such as a fully restrictable throttle, reverse gear, adjustable suspension and rear disc brake. 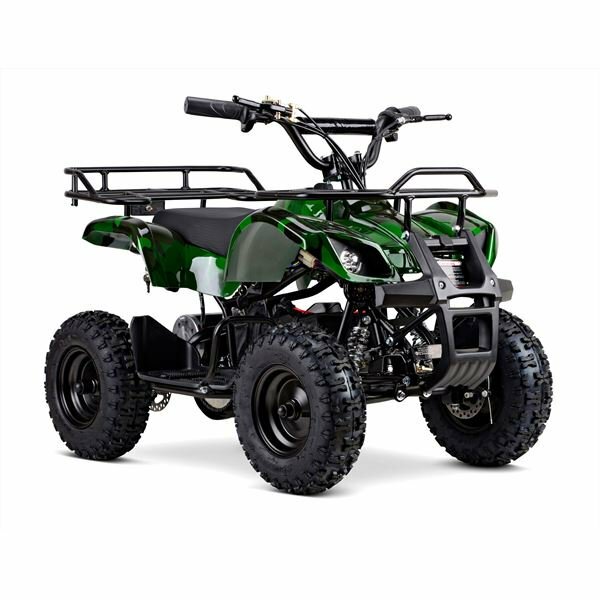 This quad is going to last your teen off-roader years to come! 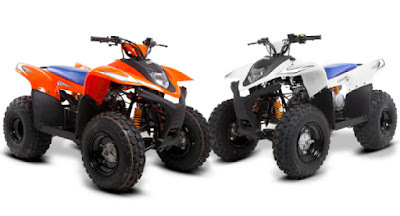 These small but mighty quads are packed full of safety features, yet come at a great value price. 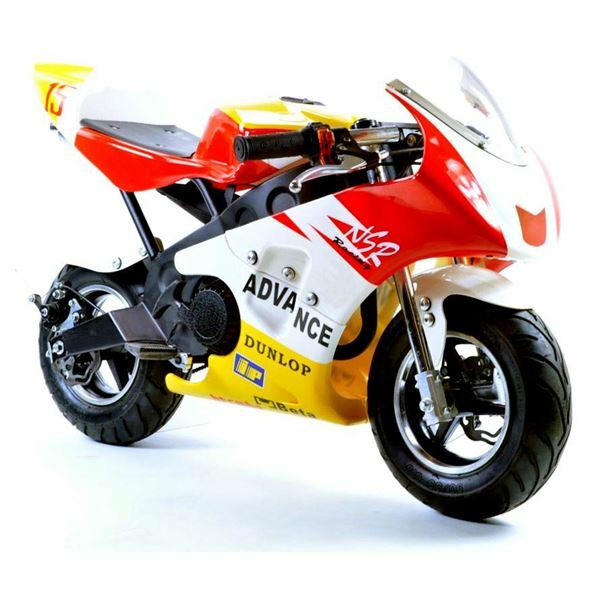 Both featuring a restrictable engine to help your little one learn at their own speed and improve their confidence. The Cub 50, has a 2 stroke 50cc engine and features a lanyard cut off which cuts the engine in an emergency. This really is an ideal starter quad. The Scout 90 is the natural progression from the smaller Cub bike. Featuring a punchier 90cc 2 Stroke engine, with electric start and Kickstart. 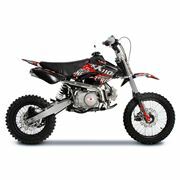 Just Landed - MXR 1300w Electric Lithium Mini Dirt Bikes! 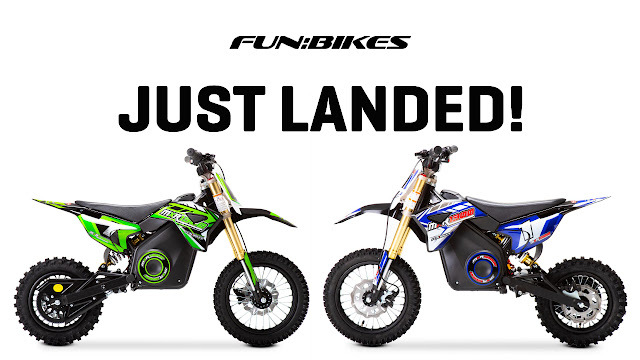 The ultimate kid's toy has just landed at FunBikes and it’s in time for the Easter holidays! 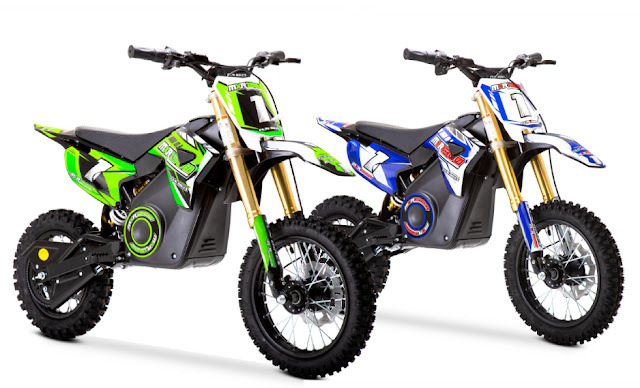 The MXR 1300w Electric Lithium Mini Dirt Bike is bigger, stronger and a better specification than any other electric mini dirt bike! Powered by a whopping 1300 watt motor, this little head-turner offers more grunt on the muddy tracks of the great outdoors! This little power-house offers more than ‘good looks’. 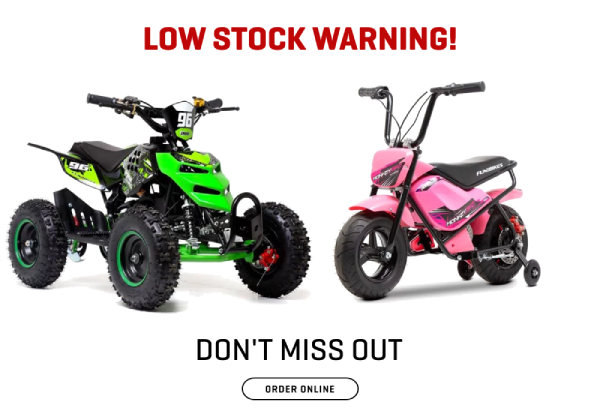 Designed to deliver little riders a taste for speed and performance; this grunty mini dirt bike comes equipped with high specification front and rear hydraulic brakes as standard. Additionally, the MXR 1300w Mini Dirt Bike also comes equipped with an upside down front hydraulic fork suspension. The rear suspension is a mono shock, both offer an incredibly smooth and controlled ride over rough terrain. The perfect next step up from our smaller electric MXR Range. Throttle Response is one of the most unique features on the new MXR 1300w. This intelligent control unit allows the rider to control the responsiveness of the throttle. Meaning that you can control how much power is delivered. From sporty and aggressive to soft and gentle, or perhaps just something in the middle, you can select a riding style that suits your little one. Similarly to our smaller MXR range, the MXR 1300w allows parents and riders to set a speed they're comfortable with. 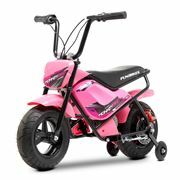 Meaning that your little adrenaline seeker can get comfortable with their riding style at their own pace. The MXR 1300w is also almost silent, meaning that your little thrill seeker won't be annoying any of your neighbours, whilst they are enjoying their new mini dirt bike! Solidly built and simple to maintain, the MXR 1300w is perfect for grass, gravel, concrete and even gentle off-roading use. Want to find out more about the MXR? Browse the full spec online today. Are you looking for a modern new commuting experience? 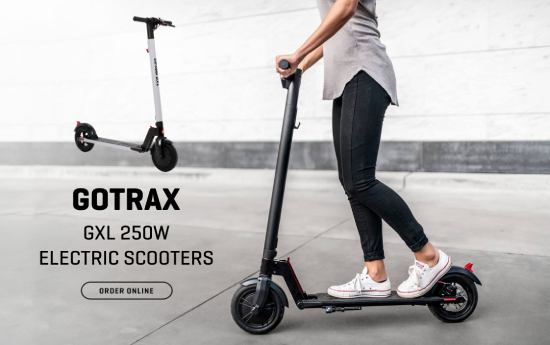 These brand new Gotrax scooters are the coolest way to get around. 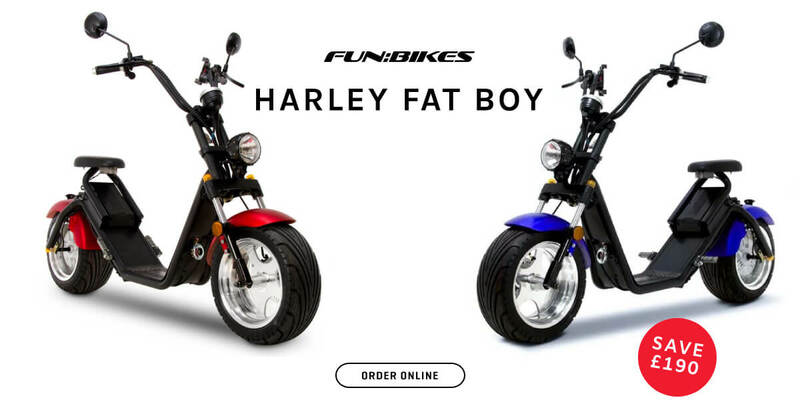 You won't find them anywhere else, they're exclusive to Funbikes! With a range of 20km, a 4 hour charge time and a weight of just 12kg. What's not to like? Featuring 8.5” air-filled tires that easily ride over bumps and cracks. 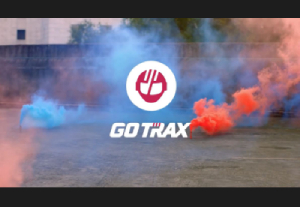 The GXL is the most powerful Gotrax scooter, with a boosted 250-watt motor and a 36v battery, speeding it up to 15 mph for a distance of up to 12 miles. 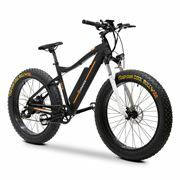 The reinforced frame allows it to support riders up to 220 lbs. 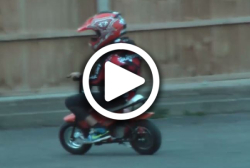 Watch These Speedy Scooters in Action here! 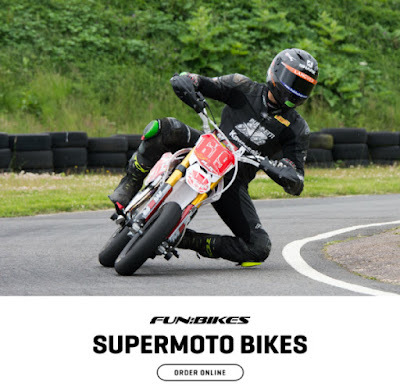 Get back on the track with our range of Supermoto Racing Bikes. Leave your competition behind with our lively race-spec models straight off the tracks! From standard to completely race ready, our range has something for every rider. Check out our different cc classes below! The RF160SM 82cm Supermoto Pit Bike is great looking and built to last. Practically race ready, this big spec bike is such fun on the track. The KM160SM Supermoto is the entry-level version of its race-ready counterpart, but don't be fooled into thinking this bike is basic! The KM160SM lowered 76cm "Race Ready" Supermoto is fully kitted out and ready for the track! Set up by our experts here at Funbikes our race ready models are fine-tuned to give you the edge in competitions! Just like their 160 counterparts, these 140cc supermoto bikes are primed for racing! The RF140SM has all the race features you need with punchy speed to match! While the KM14SM and race-ready version are proven race winners! As shown by one of our customers in the LCRRC championship! Equipped with a 90cc engine, this little cracker can take anything in its stride! 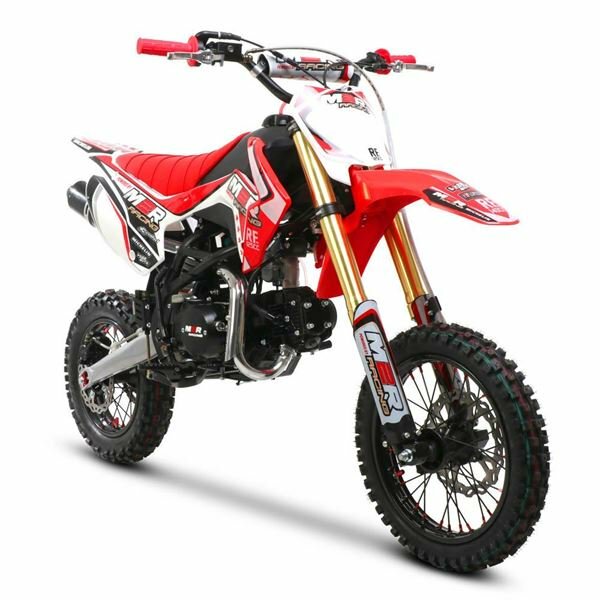 Designed for the bambino supermoto championships, the 90R has a semi-automatic gearbox that is absolutely ideal for a beginner. Although this bike is small, it’s tough, reliable and ready to put a smile on your face! 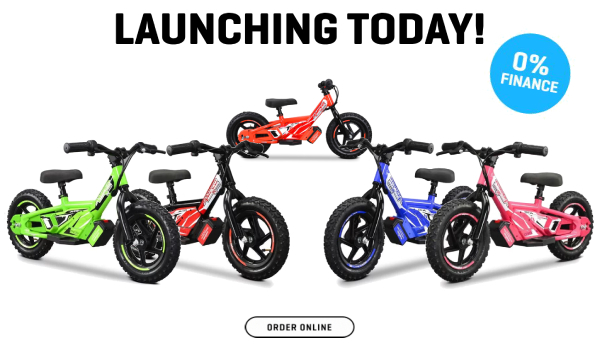 Brand New Amped A10 Balance Bikes - Lunching Today! 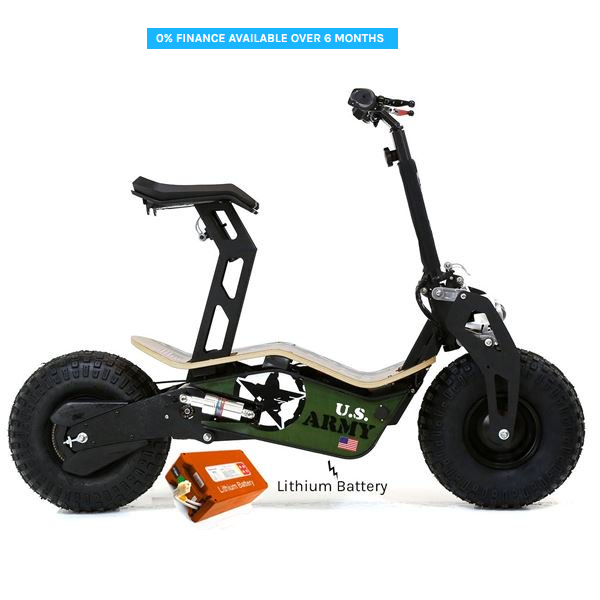 Brand New Electric Balance Bike Range! Treat your little ones to a fun-filled gift that they are going to fall in love with! These super stylish Electric Balance Bikes are bridging the gap and simplifying the transition from balance bikes to motorcycles. Perfect to start them learning from a young age. Available in 5 striking colours, these slick balance bikes are the perfect way to introduce throttle control and balancing skills to children from the age of 3 upwards. This fruity character is powered by a removable 5.2AH Lithium Battery. Which means that you can enjoy up to 30% more riding time! Increased riding time isn't the only benefit. After a fun fuelled day, you can charge your Balance Bike with complete ease. Simply remove and charge indoors. It couldn't be easier! *Subject to availability and status. Over 18s only. These super stylish Electric Balance Bikes are bridging the gap and simplifying the transition from balance bikes to motorcycles. Preorder today to avoid disappointment. Looking For Some New M2R Wheels This New Year? Do you love hitting the pits or the steep muddy terrains of the great outdoors? 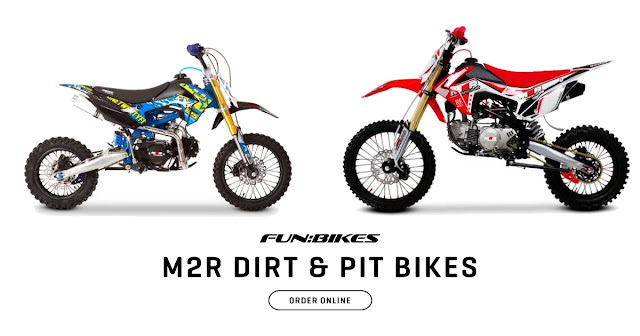 If that sounds like your ideal weekend, then why not slide into action this January with a new Pit or Dirt Bike from M2R? 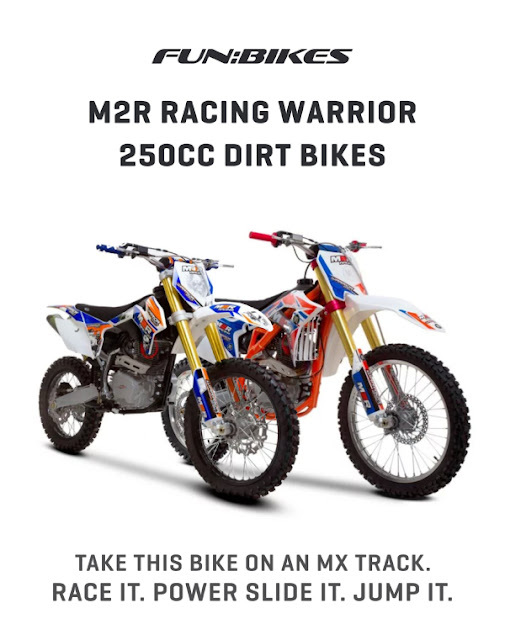 Leave those limitations behind you this New Year with a racing pit bike from M2R. Equipped with a 120cc engine, this stylish little powerhouse can take anything in its stride! Slide into the New Year I complete style with a new N2R RF160 S2 Dirt Bike! Powered by a YX 4-stroke Motorsports engine, this rapid dirt bike offers nothing but incredible performance. *Finance is subject to availability and status. Over 18s only. Click here for Terms and Conditions. We hope you're opening a very special FunBikes present this year! Don't forget to snap us a pic! Our most popular models are selling out fast! If you're planning on picking out a special Christmas gift don't delay they won't be around for long. For guaranteed Christmas delivery order by the 19th December. *Subject to availability and status. Over 18s only. Click here for terms and conditions. New Models now come complete with complimentary stabilisers! This brand new 250-watt Electric Monkey Bike has to be the ultimate kid’s e-bike! Reaching speeds of up to 20kph this bike is a smooth ride, check out its twist throttle and rear disc bracket giving it a very responsive acceleration, just switch it on and go! Watch this bike in action! Available in 6 bright and fun colours! This pocket-sized, pocket priced gem is our Big Wheel Mini Quad. Featuring a smooth 49cc petrol engine, and it couldn't be simpler to control with its pull start and rev and go power! Now with bigger wheels than standard mini quads, so you can have even more off-road fun! When it comes to Christmas we can spend hours searching for a gift that is right for our loved ones. Doubtful questions can fill our thoughts; will they like it? Is it what they want? Is it the right thing? 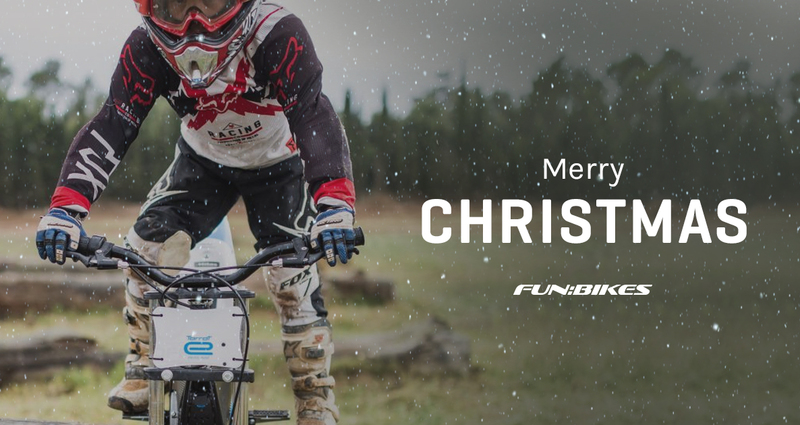 That’s why this year we have put together a FunBikes Christmas Gift Guide, to help you make the perfect purchase this Christmas. Just keep in mind that every little one is different, with different confidence levels and abilities. If you are still unsure, pop into our Showroom in Leicester. We are open 7 days a week and with our experts on hand to help, you can get a real feel for what each product has to offer. 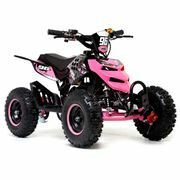 Has your little one been showing interest in all things powersport? If you are struggling to decide what to get them this Christmas, then we have a few options for you! 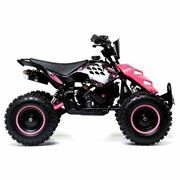 With many quads to choose from it can be difficult to decide what quad bike would be best for your little one. The FunBikes Toxic 800w Kids Electric Mini Quad is the perfect introductory quad. Available in 3 colours, the Toxic Mini Quad is also designed to bear your child’s weight as they grow, meaning it will be enjoyed for longer! 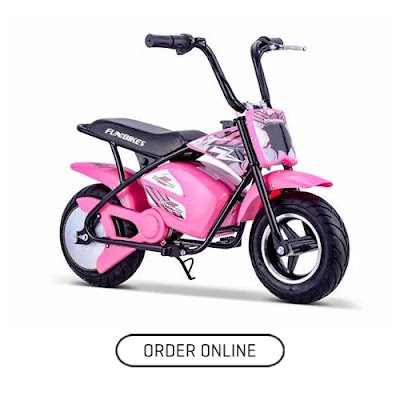 If your child is desperate for something with two wheels this Christmas, then we have the perfect gift! 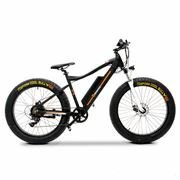 The FunBikes MB 250w Electric Monkey Bike is a great introductory bike. This awesome e-bike offers endless hours of outdoor fun! With 2 speeds to choose from (low & high) you can set your child’s bike to a speed that suits their riding ability. If you’re concerned about your neighbours complaining about the noise, don’t be! This wonderful bike is not only stylish, but it is also very quiet! 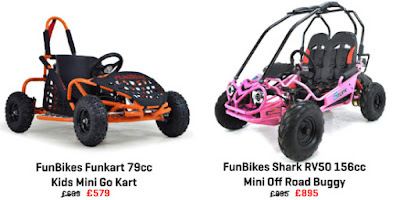 If your little one is full of confidence and has a thirst for something a little faster this Christmas, then the FunBikes FunKart 79cc Mini Go Kart is the ideal gift! 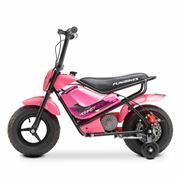 Powered by a 79.5cc 4 stroke, single cylinder petrol motor, this little powerhouse is ideal for kids aged 6+. This petrol Go Kart is a little fruitier with its performance in comparison to the electric option, offering riders a maximum speed of 25mph! 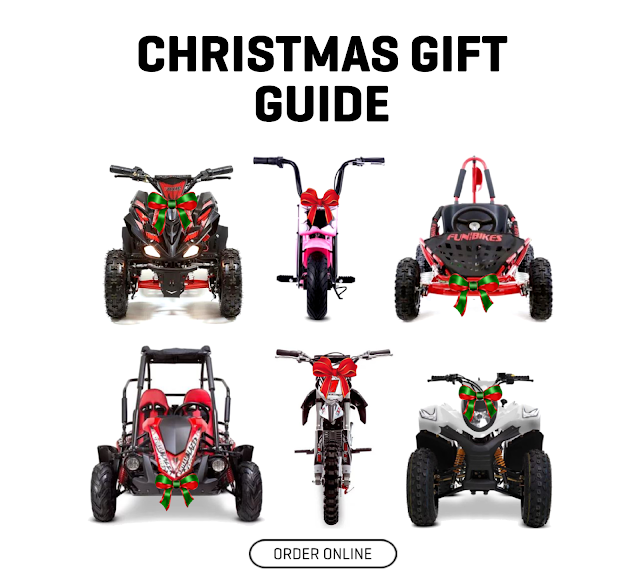 If your powersport enthusiast has already got a taste for what we have to offer but is looking for their next upgrade, then we have a couple of options for you to consider this festive season! 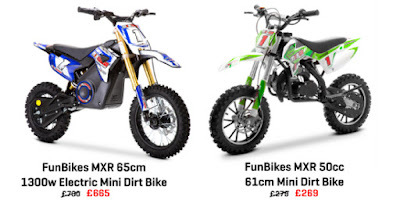 The FunBikes MXR 50cc Mini Dirt Motorbikes has taken mini dirt bikes to a whole new level. 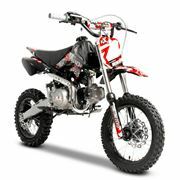 This eager 2-stroke, 49cc single cylinder dirt bike offers enough power to quench your junior adrenaline seekers thirst! The responsive acceleration, front telescopic forks, rear mono shock suspension, disk brakes and motocross styling gives this big bike some real attitude! 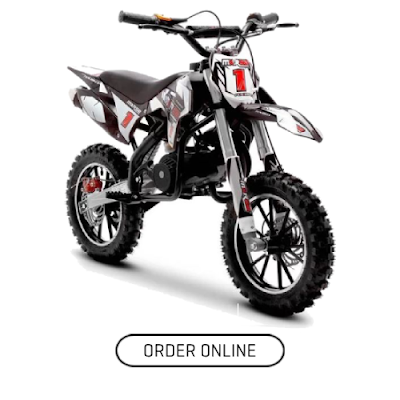 Designed for kids 6 and up, this awesome dirt bike offers your thrill-seeker the perfect tools to advance their motocross abilities! If your kid is passionate about being off-road, then the FunBikes GT80 Trail Blazer is the ideal choice for kids aged 10 and up! 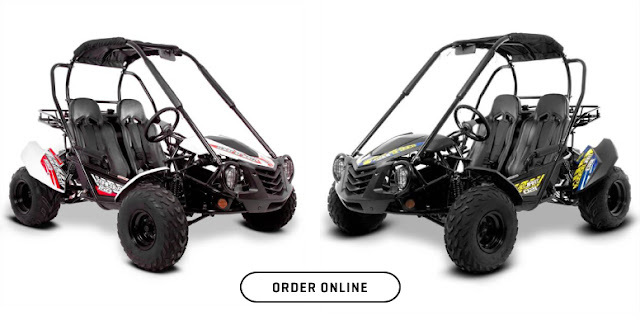 This midi sized buggy can tackle all kinds of terrain, from muddy lanes to steep hills. The 200cc engine has enough power to carry two passengers with ease, meaning that your child can share their love for being off-road with likeminded friends! If your child is looking to grow their potential in the New Year, then why not help them achieve it with a quad bike that can offer them the growth they need! 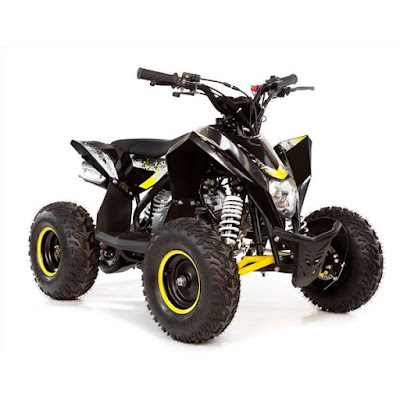 The SMC Hornet 100cc Quad Bike is the perfect quad to help further your child’s off-road ability. 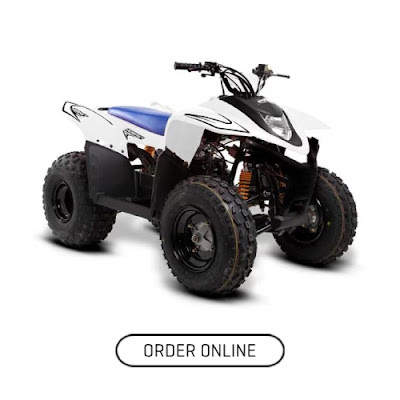 The Hornet comes from one of the world’s leading Quad and ATV manufactures, producing market leading products with high-end design and technology! The Hornet 100 still allows you to take control of your child’s speed with a fully restrictable throttle. Join Our Christmas Club Today! If you have found something that your little one will love this Christmas but are worried that they will find it before the big day, then join our Christmas Club! Our Christmas Club takes the worry of discovery out of the way. Simply click ‘This Is A Christmas Gift’ at the checkout and you will get your gift delivered to you between the 10th -15th December! Still looking for your perfect Christmas Gift? If you are still unsure what to get your little one this Christmas, then have a browse through our full range online today! 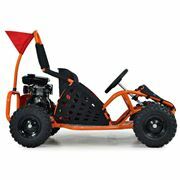 These Go Karts are amazing fun and make perfect gifts. 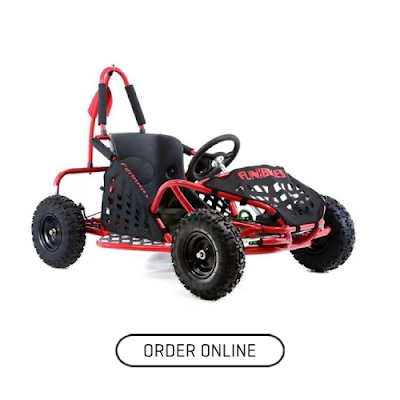 We have small karts for the mini adrenalin lovers or the full size for those big kids! It doesn't matter how old you are, we have the Go Kart for you! The Drift 2 Kart has been fully updated with a bigger engine, giving you more power, more reliability, and more fun! Expect power slides, wheel spins and top speeds of over 30mph! This is not for the faint-hearted, this kart is powerful! 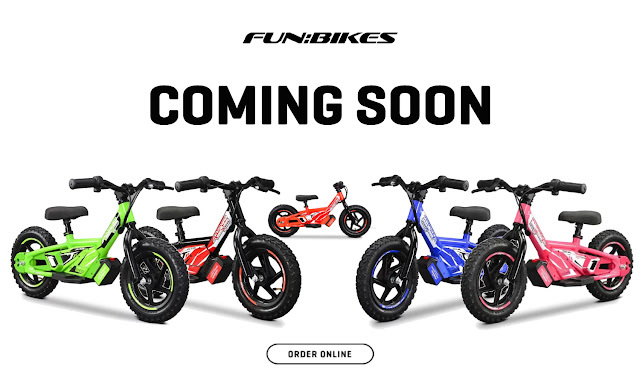 The FunBikes Fun Kart is fun, safe, MIRA tested and CE approved. 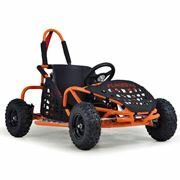 The electric is powered by a 48 volt 1000 watt electric motor, this kart also has 3-speed settings perfect for any beginner. The petrol version is powered by a 79.5cc 4 stroke motor. With a max speed of 25mph, this will satisfy any mini adrenalin junkie! 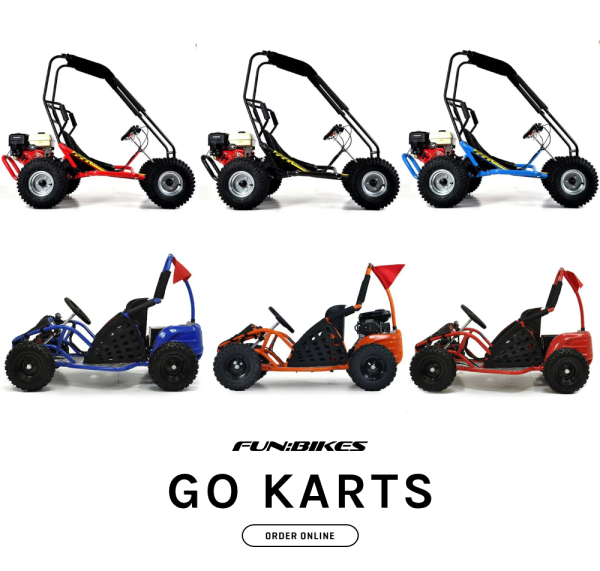 Check Out The FunKart in Action Here! Want these Go Karts for Christmas? Buy now and receive them between the 10th-15th December! Click here to find out more about our Christmas Club today! 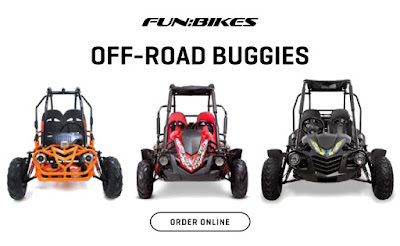 If you’re a family of off-road adrenaline enthusiasts looking for your next thrill-seeking purchase, then perhaps you should consider kitting your family out with the latest off-road buggies available at FunBikes! From those little-thrill seekers looking to take on their first muddy track to those more seasoned hill climbers, we have something for the whole family to enjoy. 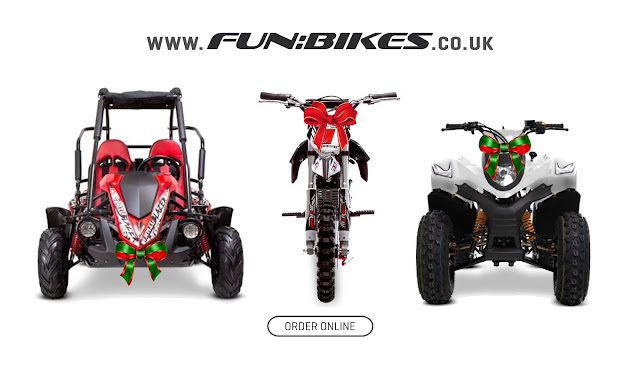 Available across all of our off-road buggy range, you can now spread the cost of the perfect Christmas gift with our 0% finance! Designed with little thrill-seekers in mind, the Shark RV50 is the perfect introductory off-road buggy for those smaller ones that are keen to get in on all the off-road action. Suitable for children up to the age of 10 years, this little ‘go-anywhere’ buggy can tackle steep banks, hillsides and thick muddy tracks! Available in 6 unique colours; orange, pink, red, blue, black and silver your keen off-roader can start their off-road journey in complete style. If you are looking for a buggy that is ideal for the more experienced off-road enthusiast, then the GT80 Trial Blazer is the natural upgrade for children aged 10 and upwards. If your little thrill-seeker has already discovered a love for hitting the muddy trails and steep hills, then this buggy is the ideal choice! The GT80 provides riders with great power and the latest safety features so that you can relax as they combat challenging terrains. This fully automatic power-house is a breeze to drive and will provide endless fun and entertainment for your adrenaline-filled off-road enthusiasts! Buggies for The Big Kids! Who said that the adults need to miss out on all the fun? 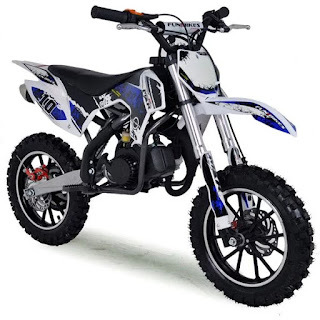 The Mud Rocks Trail Blazer 150cc is ideal for both teenagers and adults. Make your off-roading weekend into a family affair with the addition of a Mud Rocks Trail Blazer! This robust buggy is powered by a tried and tested GY6 150cc engine that has been powering power sports products for decades! So, you can ride with confidence, knowing that your buggy can take on the toughest terrains without a sweat! Worried about you little thrill-seekers finding their Christmas present? At FunBikes we take the worry out of discovery with our Christmas Club! Simply place your order online today and receive your perfect present between 10th-15th December! Want to find out more? Click this link to discover more about our Christmas Club! The Mud Rocks Trailblazer 150 is a must-have for all budding off-road driving enthusiasts! 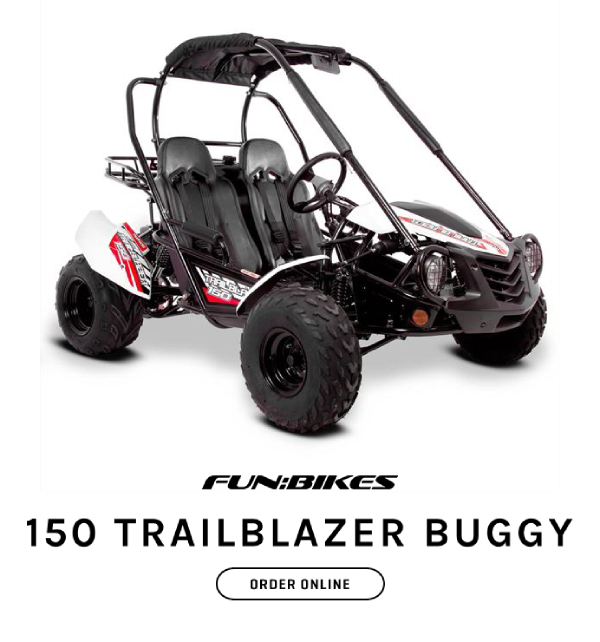 This full-size buggy has been eagerly anticipated since the launch of the smaller Trailblazer last year. Powered by a tried and tested GY6 150cc air-cooled petrol engine. Featuring a strong and robust design that can be enjoyed safely by all the family! Plus enjoy 0% Finance on this Buggy until October 31st! 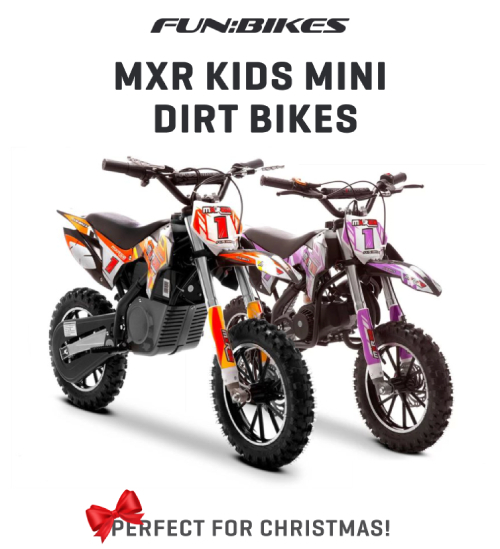 MXR Kids Mini Dirt Bikes - Perfect For Christmas! The MXR Mini Dirt Bike Range makes the perfect Christmas gift for your little ones! These bikes are an excellent starter bike to get them into riding. Fully automatic, this range is incredibly easy for young riders to learn on, they just rev and go it couldn’t be simpler! But these little bikes still have plenty of zip for that excited junior adrenalin seeker! This range is available in a quality 50cc petrol or a quiet and low maintenance 36-volt electric version. 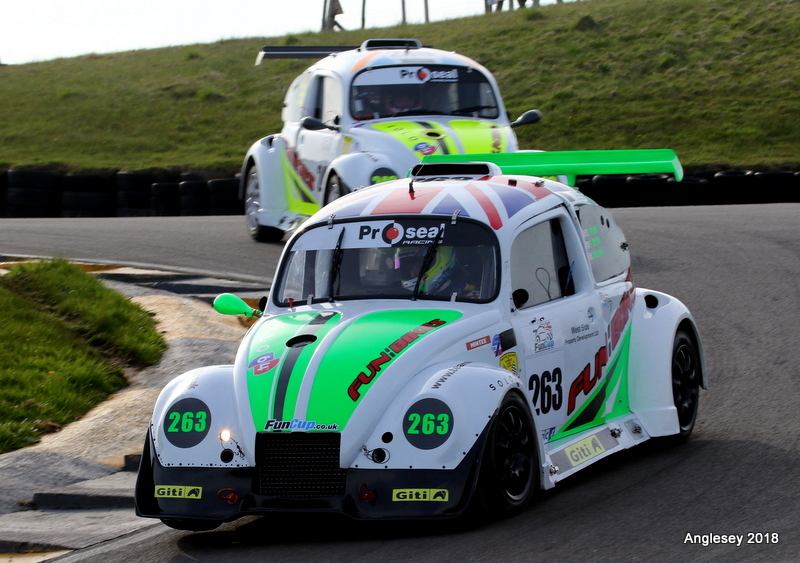 Choose from black or white plastics, with a range of bright and fun, colourful race stickers! The huge range of colours available is perfect for kids you can make sure to get their favourite!! If you are getting this bike as a gift and need to hide it till Christmas, then get these bikes as part of our Christmas club! We have just added two new and exciting products to the long line of fun products from FunBikes. 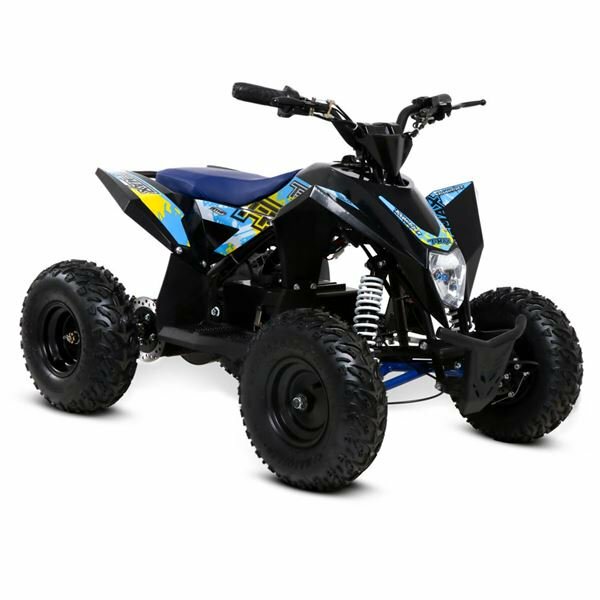 The new Bambino Kids Electric Quad Bikes are the ideal choice for any novice or intermediate rider looking to join in on the off-road fun. 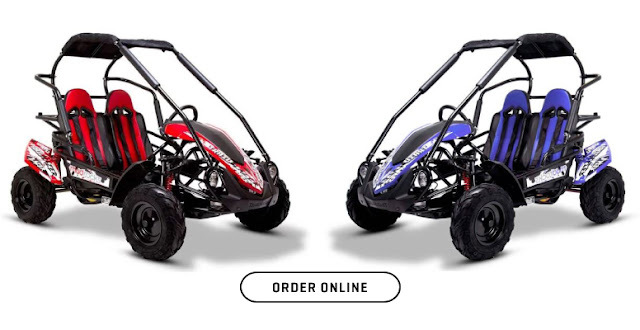 Available in two stylish designs, your little thrill-seeker can enjoy all the action in complete style. Designed with fun and safety in mind, the new electric Bambino Quads come packed with all the latest features. The 250w chain-driven motor gives the perfect amount of power which is suitable for any beginner or advanced rider, while the pneumatic knobby tires provide extra traction for a more stable and smooth ride. 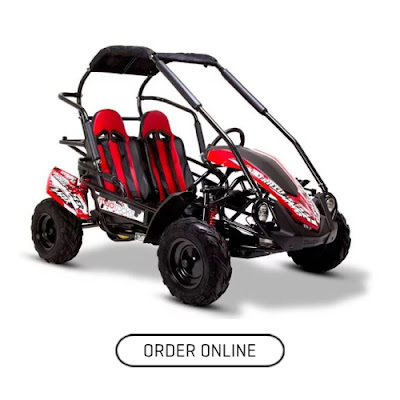 Your little rider can now enjoy their quad bike adventures in complete comfort. The deeply padded seat and foot rest makes those bumpy tracks a breeze to endure. Enjoying those weekend rides has never been so easy. Simply grab the realistic twist grip throttle and enjoy up to 40 minutes of gentle off road or on road fun! 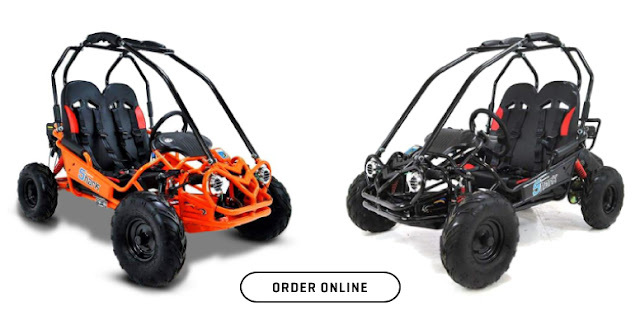 The new Bambino Quads make the ideal Christmas present for any little off-road enthusiast! Worried about how you are going to store it for all those months on the lead up to Christmas? Browse the Bambino Quads Today! 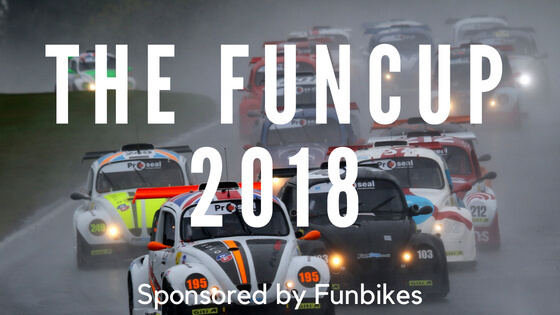 Join The Funbikes Christmas Club 2018! The Funbikes Christmas Club is back! 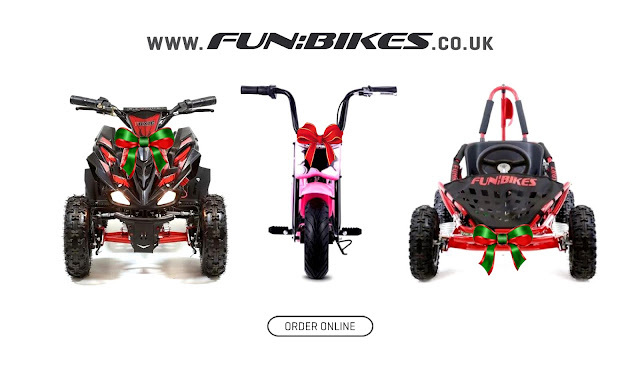 Make Christmas Shopping Easier this year with Funbikes. We know it seems too early to be talking about Christmas, but if you promised not to leave presents to the last minute again this year then we have the perfect thing for you. Christmas isn’t too far away and if you’re planning an extra special Funbikes treat for someone you know here’s your chance to get in there early! So, What is The Christmas Club? 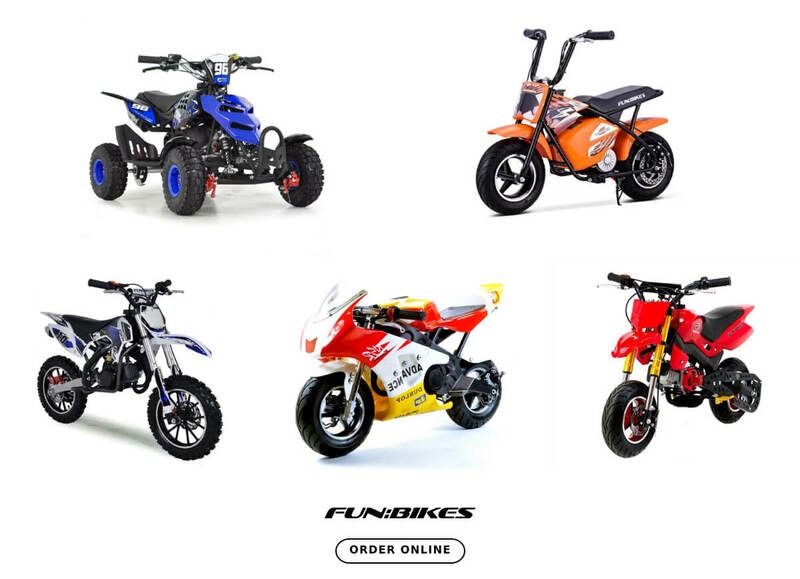 The Christmas Club is Funbikes’ way of making gift shopping easier for you! If you want to purchase a bike for a loved one this Christmas we will store the bike for you until Christmas, so you don’t have to find a hiding place! Conveniently dispatched between the 10th – 15th December, so it’ll arrive in plenty of time for the big day! Using the Christmas Club means your warranty will start on the 25th of December, so you don’t have to worry about anything. We started this Club as the Christmas period is one of Funbikes’ busiest times - and we don’t want the bike you’ve had your eye on to go out of stock in our Christmas rush! We will then store it for you until it is ready to be delivered in time for Christmas. Bikes will be shipped between the 10th and 15th of December. The bike's warranty will commence on the 25th of December. So get shopping! 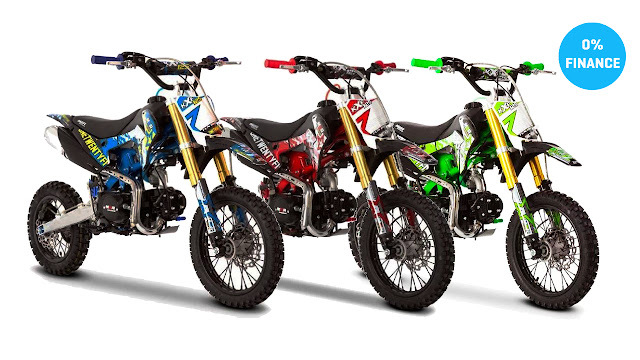 View our ranges of Pit Bikes, Quads and Dirt Bikes here! 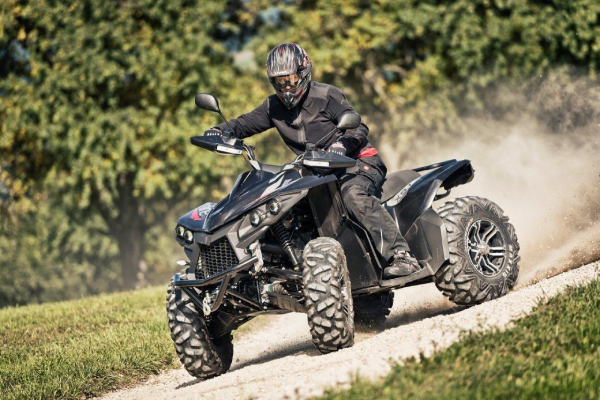 The M2R Racing Warrior has everything you need to maximize your thrill-seeking experience on any terrain. 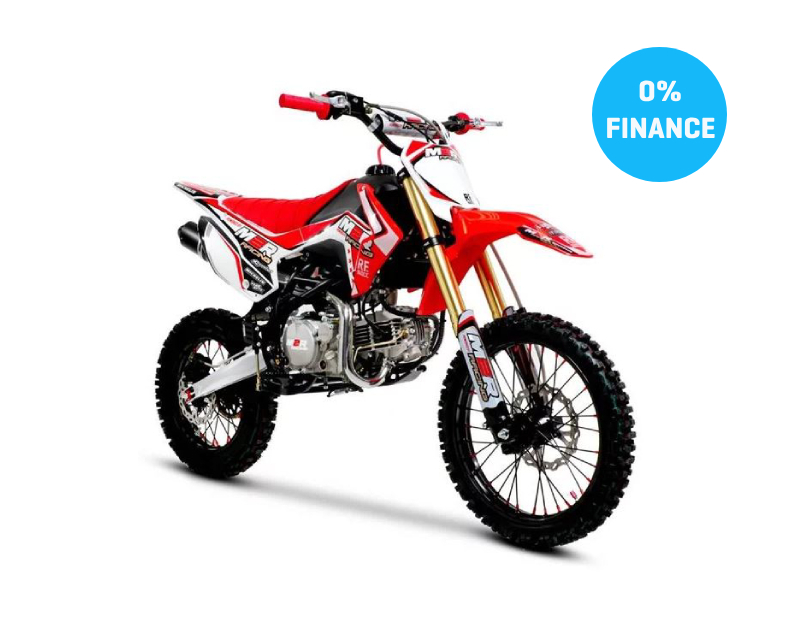 This 250cc bike is the perfect beginners' bike for the serious would be off-roader, or motocrosser. Equipped with stylish aluminum wheels and fully adjustable front forks these powerful head turners ensure a stable and superior ride! Jump, Slide and Ride through the track with complete confidence, as you navigate the aggressive terrain beneath your tires. Leave your competition at the starting line as you unleash this stylish powerhouse on any MX track. With all the power and the looks, we are certain that you won’t be left disappointed. This series certainly impressed us, and we're convinced it's going to impress you too! The Baja Styled Sand Bike, with its unique styling and retro cool looks, this funky bike is guaranteed to turn heads wherever you go. It's certainly a firm favourite with all of our staff. 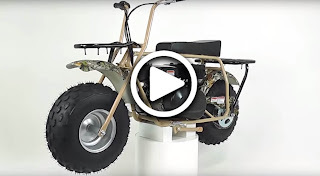 A simplistic but immensely strong rigid frame, single rear drum brake, an automatic engine and a twist & go throttle means almost anyone can jump on this and ride away. It's fitted with a gutsy 196cc 4 stroke engine which is a clone of the Honda GX200 engine. In all honesty, it's probably overpowered, but hey, that just means even more fun, right? Sand bikes have been hugely popular in the last couple of years, and for good reason. These fashionable bikes are great value for money with excellent quality and a huge amount of power. Check Out The 360 View Here! The Fun Cup is an annual race in which teams of 2 – 6 drivers compete over 9 endurance races. The championship consists of one class and a trophy is awarded to the top 3 teams after each race. with the car engines and gearboxes sealed and regulations strictly controlled, the racing is super close. The cars are race designed, single-seaters, with super-strong space frame chassis. They are powered by an 1800cc, 130 bhp VW/Audi petrol engine, with the popular Sadev sequential gearbox. Paddle-shift and pit-to-car radio are also available as optional extras and they all feature race brakes and fully adjustable suspension. All cars are identical in specification, with no-performance modifications. 4 races down next round is in Zandvoort on the 30th June. All is to play for in this 3-hour race as we speed closer to the final race at Donington Park! 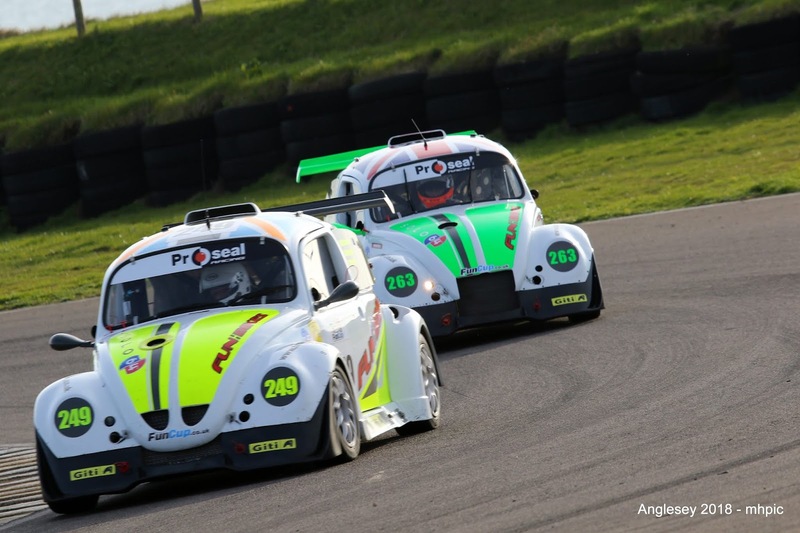 For full event details for Zandvoort: Click Here. The Championship is filmed at each UK event and Spa, this means if you cant make it to the events you can catch up on all the action by watching Sky Sports “Raceworld” programme or catch them online streamed on Motorsport TV. Or view previous races on Youtube. Take advantage of our latest hot offers! 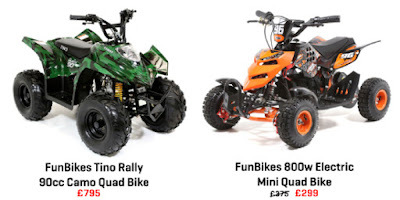 Our "Mini" range of Quads, Motos, Motards and Dirt Bikes. Designed for track racing and packed with the latest features! Mini Motos are inexpensive to purchase and maintain. This pocket-sized, pocket priced gem is simply fabulous fun! This quad has been specifically developed and improved for long-lasting quality and reliability. 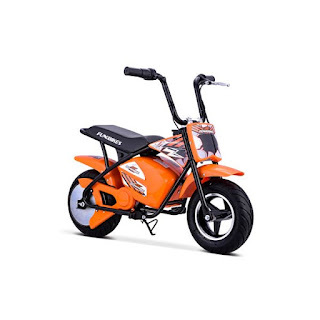 This bike includes safety features such as restrictable throttle for speed control, to keep your little ones safe as they learn. Available in 6 colours to choose from! The perfect starter 50cc kids motorbike! 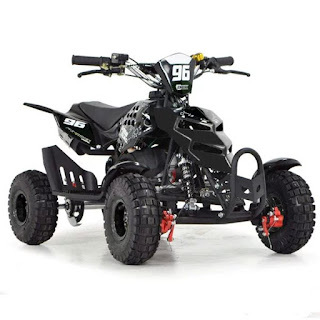 This mini dirt bike has plenty of zip for that excited junior adrenalin seeker. Designed to be very simple to ride, it's fully automatic, so just twist the throttle and go. This bike is very stylish and is available in 8 different colours! This is one of the best MT4A series bikes that you can buy and have been designed and built with the enthusiast in mind, with quality being checked at every stage of production. Available in 6 striking racing colours. 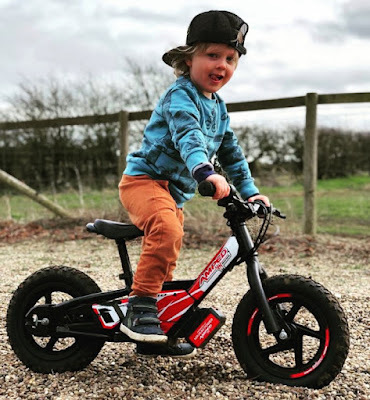 This new Funbikes Kids Monkey Bike takes things to a new cheeky fun level for the junior rider, and has to be the ultimate kid’s e-bike! 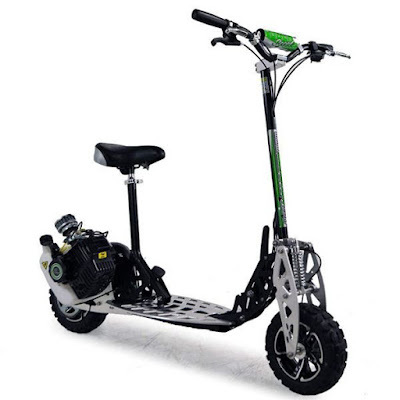 This lively bike has a large 250-watt motor and can reach speeds of up to 20kph! Available in 5 stunning bright colours. Introducing the Funbikes Harley Fat Boy Electric scooter, available in RED or BLUE. The Harley’s new minimalist and cool design is a hybrid of an electric vehicle and scooter. We call this the Harley of electric scooters. 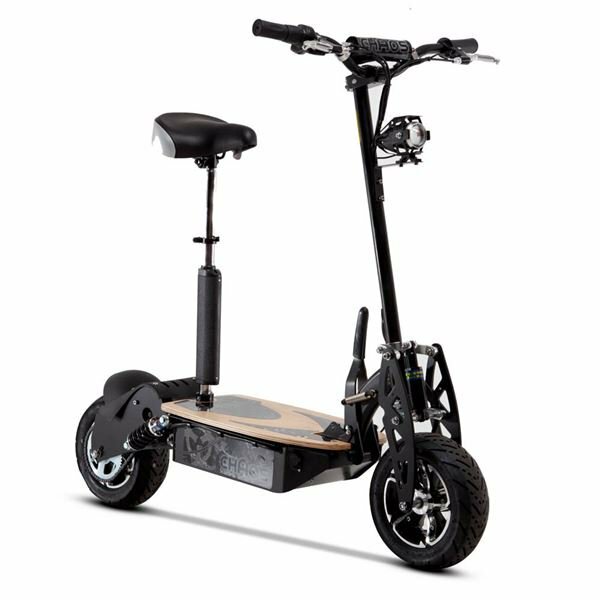 With a 1200watt electric motor powered by a removable 60 volt 20AH lithium battery, It has a huge range of 35 miles, and a speed of 30 mph! The Harley is the very latest in design with the front wheel slightly thinner than the rear making it more manageable than other similar bikes. 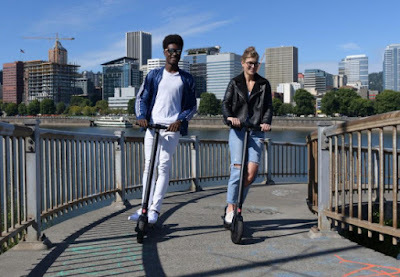 This stylish scooter includes exclusive specs like: custom alloy wheels, a phone holder with a USB charging port, hydraulic front and rear brakes, a road legal lighting kit and a cool matt black paint finish. Not only can you ride this scooter just for fun, you can also register it as a conventional scooter for use on the road as it has its own EEC certificate! 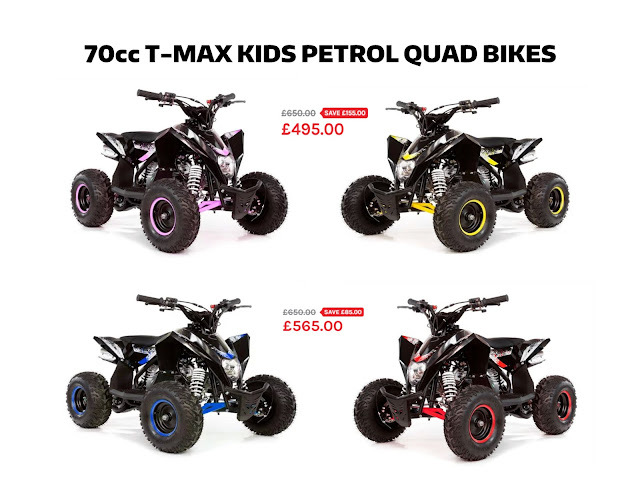 FunBikes are the UK’s number one supplier of petrol and electric battery quad bikes, and these little quads are the perfect way to keep the kids happy this spring! 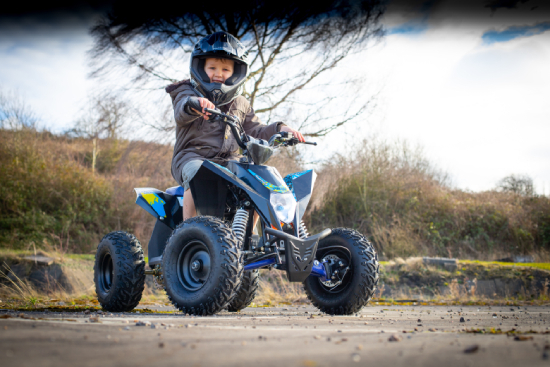 Take the kids off-roading with these durable and safe quad bikes, and with their summer holidays right around the corner, it’ll keep them busy on those long sunny days. Take advantage of our hot offers at FunBikes this March! 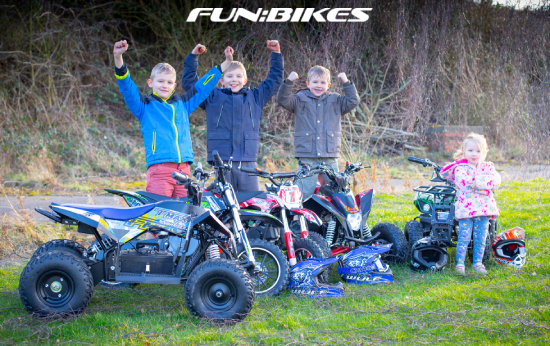 Get ready for the warmer weather and longer days with our range of FunBikes bikes and quads, ideal for getting you out off-roading. Save £155 on the FunBikes 70cc T-Max kids quad bike, making it our cheapest all-terrain quad bike. Featuring a robust and reliable 4 stroke, (push button) electric start engine; fully automatic rev and go transmission and, essential safety features, such as a restrictable throttle, fully enclosed footwells, and rider lanyard. The RF125 dirt bike is the ideal bike for riders taking the next step up from a mini dirt bike. equipped with a 125cc engine that inspires confidence due to its immense power delivery, this bike can take anything in its stride! Equipped with lots of features, kids will have the time of their lives riding this tough little monster. The Ranger features LED headlights, new larger wheels and tyres with a farm style UTV style body, including front and rear racks for the full farm quad look. Plus, save £150 for a limited time only. 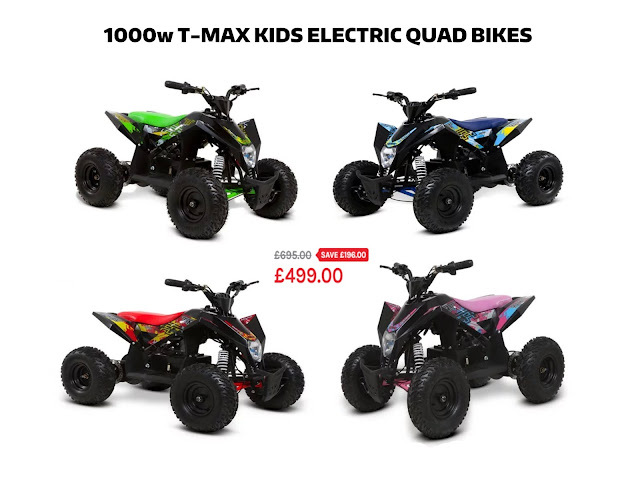 Pick up the FunBikes T-Max Roughrider 1000w electric kids quad bike today and save £1956. 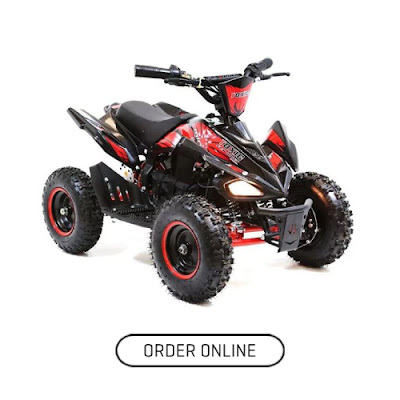 The T-Max Roughrider junior quad bike almost silently reaches speeds of up to 27kph in it's highest speed setting. Powered by a massive 1000w motor there is hardly maintenance compared to a petrol quad. We produce and sell a new generation of petrol and battery-powered electric scooters which have taken a technological leap sure to leave other scooters in the background. Loaded with innovative features perfect for taking to the skate park or just riding about. 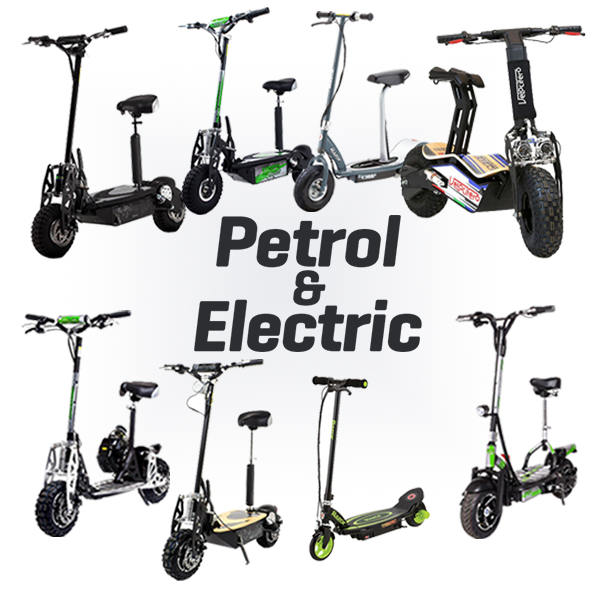 Both adult & junior, petrol, and electric Powerboard Scooters are available in the range from 49cc-71cc and our electric scooters include 500w, 800w, 1500w and a whopping 1600w model with a lithium or lead acid battery. This is Uber Scooters newest high-performance scooter. Designed and manufactured using state of the art techniques, making them superior to all others on the market. From Puzey Design, Uber scooters are loaded with innovative features ensuring their high quality shines through. The new Chaos 1600w has now arrived. Distinguished by supersize alloys, sport design wooden deck, and sport race tyres. 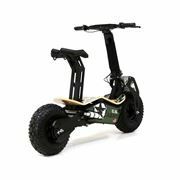 The Chaos 1600W Electric Scooter will take you at speeds of up to 40KM/H, and has the highest top speed of all the electric scooters in Funbikes Powerboard's range. Electric, foldable, and a modern and elegant design. MAD, the new VELOCIFERO, is an example of how a bright idea turns into a successful product. Ergonomic shapes and fat wheels will be part of each path. Available with 0% finance.